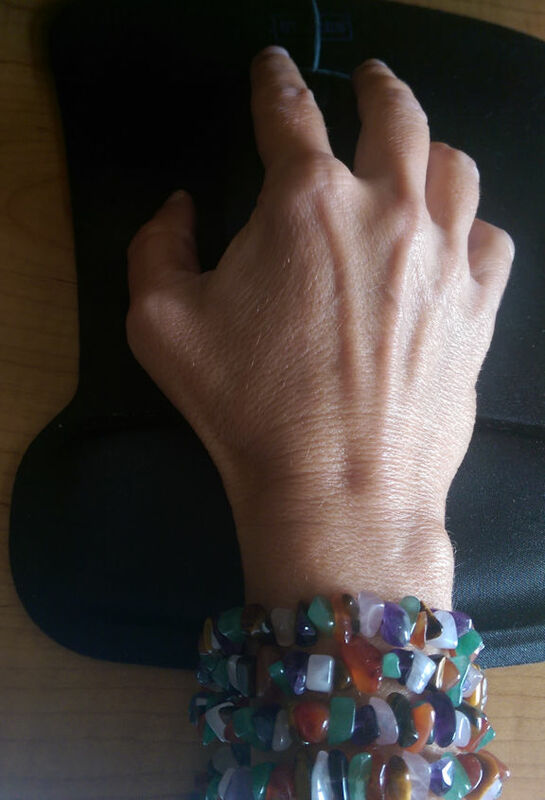 The crystal bead necklace that I’ve been calling my worry beads (shown in other Nurturing Thursday posts here and here) served as a bracelet today, instead. My right wrist has been feeling sore this week. As far as I know, this is not from exercise or from anything unusual, so it’s likely that I have been putting more pressure on it while sitting at the computer. I looped the beads around my wrist both to ensure I don’t press on it and to increase my body awareness. Now I am wondering if there may be some area of my life where I’ve been doing too much “pushing” to get things done faster, which has caused me to subconsciously push down on the mousepad harder than usual. Our bodies do send us messages sometimes—we just have to be open to listening! I love your nurturing Thursday posts! You are very right about our bodies sending us messages! I have a similar bracelet/necklace — they are my energy and healing stones I carry them with me on energy retreats, when I need extra energetic protection, and when I travel Messages are given to us in a variety of ways — good you are looking into it! I haven’t gone to any energy retreats, but will surely take it with me if I do! Hi Meg, your necklace is gorgeous, I’ve seen it before, and makes a lovely bracelet. For sure our body send us signs all the time, we only need to be ready to understand them. Hope your wrist is better. Have a lovely weekend!